We took the Palomino Sabre through its paces on the back roads of south-central Ontario. The trailer pulled like a dream behind our F-350 Ford duallie. 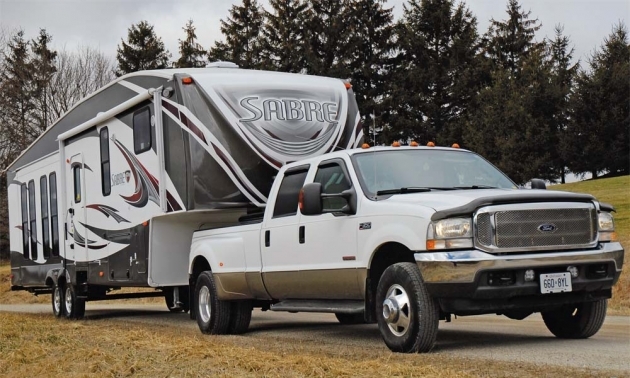 We had the pleasure of visiting Camp-Out RV, in Stratford, Ontario, to check out the 2012 Palomino Sabre 34 REQS fifth wheel trailer, one of the newest models from Forest River, Inc., which is part of the Berkshire Hathaway group of companies. 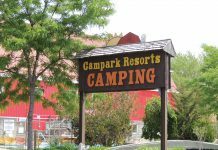 This was a special occasion for many reasons, because our visit coincided with the start of Camp-Out’s 50th Anniversary year – truly a landmark achievement. 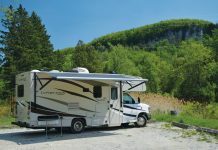 Camp-Out RV serves the south-central Ontario market with a variety of recreational vehicles, and the owners, Sam and Debbi Parks, are very active in the community – Sam was named the Ontario RV Dealer of the Year in 2010, an achievement conferred upon him by his fellow RV dealers. 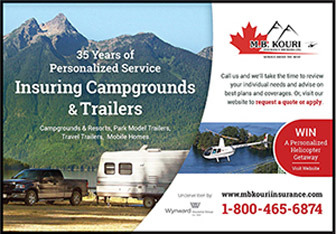 This award was a fitting tribute to a family business that is the longest established RV dealership in the region. The Stratford area is famous throughout the world for the Shakespeare Festival, and we had the pleasure of touring the beautifully landscaped parkland surrounding the theatre district, putting the trailer and Ford F-350 tow vehicle through their paces. 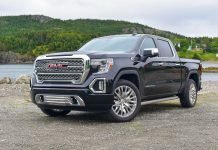 The highways in the region are well-paved and offer little challenge for a road test, so we took to the back-country roads to see how the Palomino handled. At highway speeds, the trailer tows with very little effort. On tight, winding roads balance is very good, and once the trailer and tow vehicle brakes are properly synchronized, the combination rolls confidently, even in crosswinds. The 16” wheels and steel belted radial tires are well suited for a vehicle of this type. 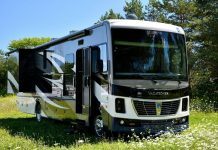 The vehicle is built for touring – the axles have Super Lube® bearings for years of trouble free RV adventures. 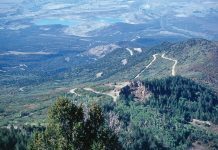 You can order the optional Trail Air® Equa-Flex™ suspension, which is a good idea if you travel long distances, or traverse challenging roads. A Trail-Air pin box would be a good idea. Our tour of the region was a pure pleasure – except for the weather, which was overcast and definitely not conducive to photography, although it was surprisingly mild for this time of year. Placing the fridge, the Magic Chef® microwave, and the stove into the slide-out is a brilliant idea. 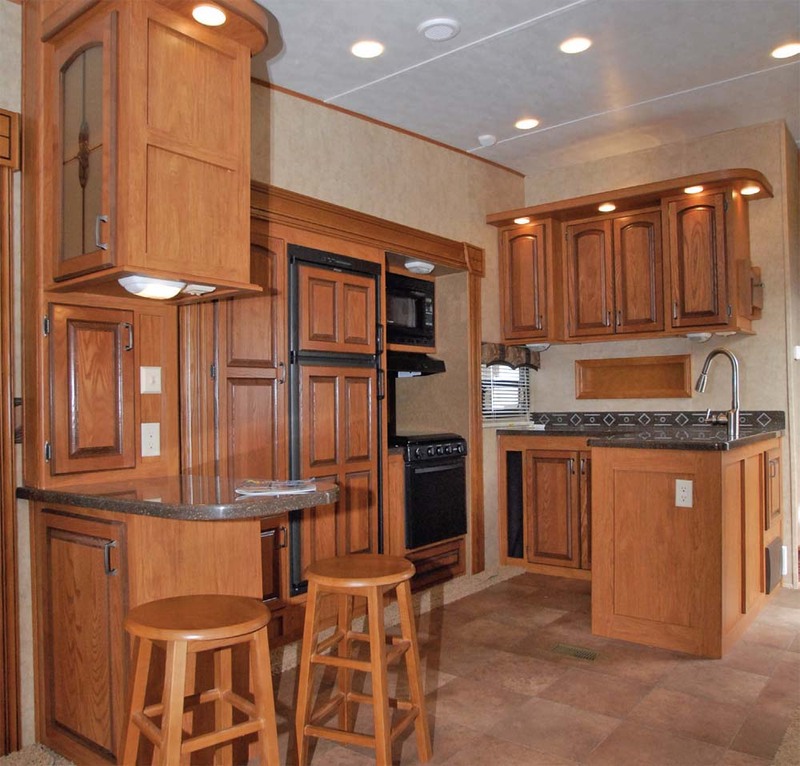 The L-shaped kitchen counter maximizes your space in the mid-section of the vehicle. When you look at the side profile of the Sabre, you will see a distinctive slope that Palomino refers to as “mid-profile”. The aerodynamic advantages of this shape are that it reduces the height of the front cap, and it has no sharp edges to catch the wind. 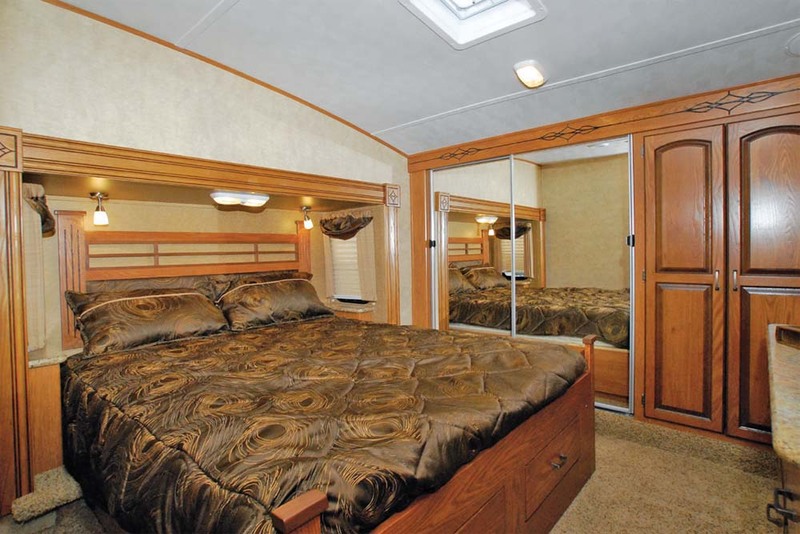 For practical purposes, the lower front end only affects the height of the front closet – the front bedroom has a slide-out that on the driver’s side to allow the 60” x 80” queen size bed to be placed across the width of the trailer. The Sabre is described as having true six-sided aluminum construction, with vented attic system, which means that the floor structure is welded aluminum, the roof structure has 4 ¼” tapered aluminum roof trusses, and the sidewalls are constructed with welded aluminum studs (with all openings framed in aluminum tubing). This is a serious example of RV engineering. The seamless 5/8” floor decking carries a 25-year warranty, and there is a large capacity heat duct plenum for all-season climate control. EcoBatt Glasswool insulation, a Darco wrapped main floor moisture barrier, and corrugated, puncture resistant underbelly combine for an R-14 rating. The fresh, grey, and black water tanks are wrapped in heat reflective insulation. The crowned roof of the Sabre is equally impressive, with one-piece EPDM rubber roof material that carries a 12-year warranty, applied over a 3/8” roof decking layer. The aluminum frame construction is insulated with EcoBatt Glasswool, and the in-ceiling AC ducts are wrapped for energy efficiency and to reduce the possibility of condensation. The interior surface is a 1/4” decorative ceiling board. The joint between ceiling and walls is very nicely finished, with no gaps or flaws. The sidewalls are a sandwich consisting of a high-gloss gel-coated fiberglass exterior over a 1/8” luan backing, then a second 1/8” luan backer with staggered seams, over the aluminum studs and high density block foam insulation, completed by the interior 1/8” interior decorative board. 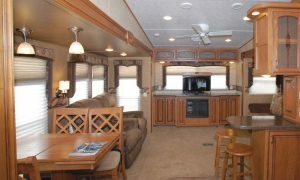 Entertain your guests in the comfort of this splendid lounge area, with dinette seating for up to six people. Note the retractable 32” Toshiba® LCD TV on an electric lift system – for travelling, the TV descends behind the electric fireplace. An AM/FM/CD/DVD home theatre surround sound system completes the entertainment centre. On a dark and dismal day, we really enjoyed the ambiance of the Sabre. The generous number of in-ceiling, pendant, and soffit lights give the interior an appeal that looks like more like a luxury condo than a travel trailer. 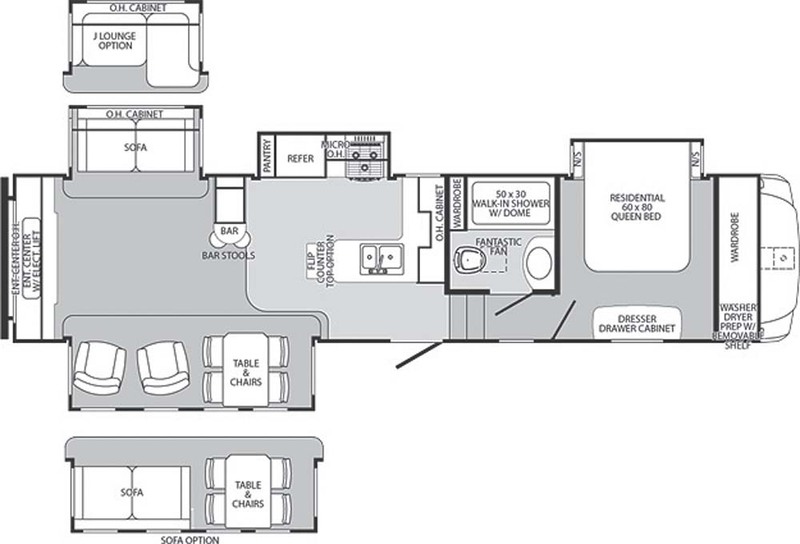 We were particularly impressed by the way the floorplan was engineered, with some mobility in the “slides-in” travelling configuration, and a wonderfully open and spacious effect with the slides extended. The range of interior décor selections is something that could only be offered by a company as large as Forest River. 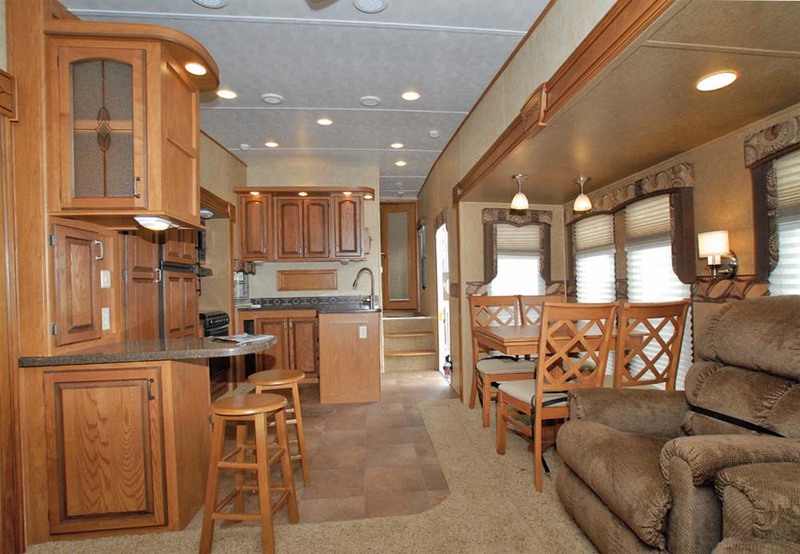 Our test vehicle was simply splendid, with upholstered window valences, attractive and durable furnishings, and cabinetry that rivals the residential upgrades in many homes. The large windows in the central and rear sections of the vehicle provided a vista that would be quite spectacular in a scenic campground setting. We have had our eye on the Sabre for the past few years, waiting for the opportunity to take one out for a road test. 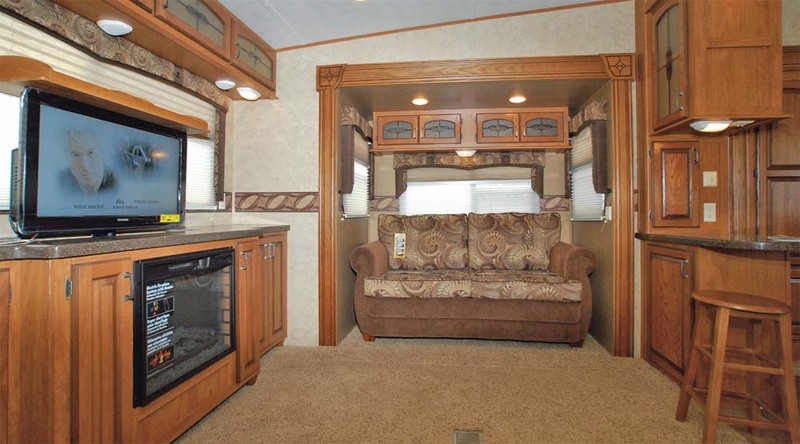 This 2012 REQS (Rear Entertainment Quad Slide) model is a stunning example of modern RV elegance. Every section of the Sabre is thoroughly designed, from the optional Beauflor® plank wood flooring to the very quiet ceiling fan. The Sabre comes with residential Shaw® nylon carpet with R2X® an innovative carpet stain and soil repelling system. The RV gourmet will definitely enjoy this fifth wheel galley, with generous solid surface counter space, an 8-cu. ft. Dometic® refrigerator with wood panel door front, microwave and oven. Placing the appliances into the slide-out section enhances the interior space available, and the array of full extension drawers and spacious cabinets are well placed. The slide-out pantry is great – I want one of these for my house! Palomino designers created a natural divider between the galley and the lounge by installing a bar island, with twin bar stools. 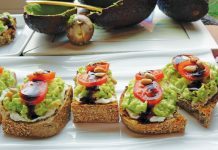 The countertop has an overhang that acts like a table – this is a very convenient place to sit for a light snack, and a great place to be to watch the game on the TV. Our test vehicle was equipped with the optional flip counter option, extending the usable counter space. 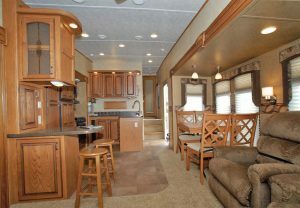 As previously described, the queen size bed is positioned across the width of the trailer, with the headboard located in the front slide-out section. This allows easy access to make the bed, and the under-bed storage utilizes drawers that glide on steel tracks, rather than the old lift-the-mattress system, which was the cause of many sore backs for our road test teams! The hanging closet space across the front of the trailer is tall enough for your wardrobe, and it is a very effective use of space in the vehicle. 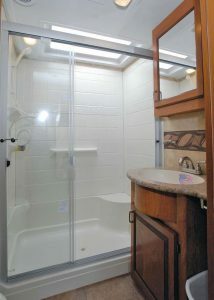 The ensuite bathroom includes a walk-in shower, and a very nice undermounted Stonecast sink. 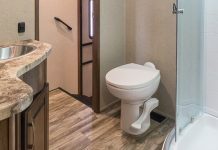 A strategically placed door separates the bedroom from the bathroom, and the residential style porcelain pedestal toilet saves space in the bathroom. 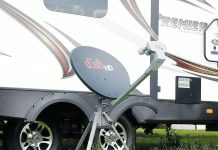 With high-tech construction and insulation, this trailer provides four-season comfort for the RV traveller. High capacity in-floor heat ducting and a 13,500 BTU air conditioner with Quick Cool dump are controlled by a residential style digital thermostat. 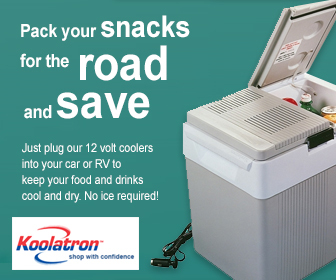 There is a 65 amp power converter with smart fan cooling, and 30 amp service with detachable marine power cord. 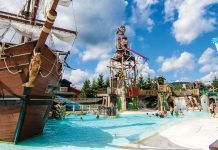 Options include a 15,000 BTU air conditioner with Quick Cool and 50 amp service with wiring in place for a second A/C unit. 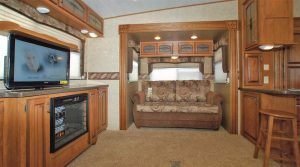 As you might expect, every RV system in the Sabre is thoroughly planned and executed to make your camping experience a pure pleasure. 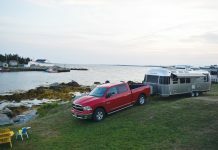 Park the trailer, set the brake, connect the electrical system, and extend the optional electric landing gear to level the unit. Your slides extend in seconds at the touch of a switch, and the A&E electric awning with adjustable arms rolls out to complete your campground castle. 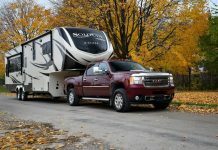 All of your gear is accessible in storage compartments that have slam-latch luggage doors finished in the same fiberglass surface as the balance of the unit. Your utility compartments enclose the “within reach” water heater bypass valve and the “easy siphon” winterizing valve. 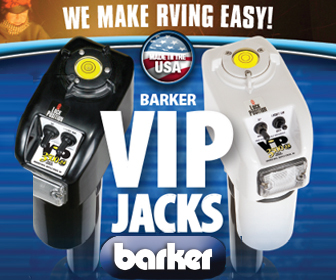 All of your RV system hookups are conveniently located within the exterior compartments. With the Canadian dollar trading at or near par, the Palomino Sabre 34 REQS is an excellent value at the MSRP of just $49,499 (F.O.B. 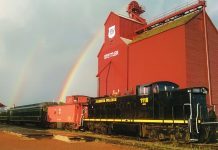 Startford, not including taxes, P.D.I. and options). We were very impressed with the vehicle as tested, and with the base model that is available without the various options.